“MONS” “RETREAT FROM MONS” “MARNE 1914’18” “LA BASSEE 1914” “YPRES 1914 ‘15 ‘17 ‘18” “LOOS” “FESTUBERT 1915” “SOMME 1916 ‘18” “ALBERT 1916 ‘18” “MESSINES 1917” “SELLE” “GAZA” “CAMBRAI 1917 ‘18” “VITTORIO VENETO” “DOIRAN 1917-18” “MACEDONIA 1915-18” “GALLIPOLI 1915” “PALESTINE 1917-18” “MESOPOTAMIA 1915-18” “N W FRONTIER INDIA 1916- 1917” “DUNKIRK 1940” “VILLERS BOCAGE” “NWEUROPE 1940 ‘44-45” “TOBRUK 1941” “EL ALAMEIN” “MEDENINE” “OUED ZARGA” “LONGSTOP HILL 1943” “NORTH AFRICA 1940-43” “SICILY 1943” “SANGRO” “SALERNO” “MONTE CAMINO” “ANZIO” “CASSINO” “GEMMANO RIDGE” “ITALY 1943-45” “MALAYA 1941-42” “NORTH ARAKAN” “KOHIMA”. “TANGIER 1662-1680” “NAMUR 1695” “GIBRALTAR 1704-05” “DETTINGEN” “MARTINIQUE 1794” “VIMIERA” “CORUNNA” “TALAVERA” “GUADALOUPE 1810” “ALBUHERA” “SALAMANCA” “VITTORIA” “PYRENEES” “NIVELLE” “NIVE” “ORTHES” “TOULOUSE” “PENINSULA” “GHUZNEE 1839” “KHELAT” “AFFGHANISTAN 1839” “CABOOL 1842” “MOODKEE” “FEROZESHAH” “ALIWAL” “SOBRAON” “SOUTH AFRICA 1851-2-3” “SEVASTOPOL” “TAKU FORTS” “PEKIN 1860” “NEW ZEALAND” “AFGHANISTAN 1878-1879” “SUAKIN 1885” “BURMA 1885-1887” “TIRAH” “RELIEF OF LADYSMITH” “SOUTH AFRICA 1899-1902” “AFGHANISTAN 1919”. The Colours of the 3rd and 4th Territorial Battalions were identical to the 1st Battalion Colours with the following exceptions and additions. The Battle Honours Festubert 1915, and Gaza were borne on the Queen's Colours of the 3rd and 4th Battalions (TA) but NOT on those of the 1st Battalion. In commemoration of its service as 42nd Royal Tank Regiment, the 4th Battalion (TA) inherited from the 23rd London Regiment the Honorary Distinction of a badge of the Royal Tank Regiment borne on the Regimental Colour. This badge carried four scrolls; the first bore the dates "1941-45" and the other three the battle honours NORTH WEST EUROPE, NORTH AFRICA, ITALY. This rare distinction was displayed at bottom centre of the Regimental Colour immediately below the Battle Honour Scrolls. "LE CATEAU" "AISNE 1914" "ARMENTIÉRES 1914" "LANGEMARCK 1914" "GHELUVELT" "HILL 60" "GRAVENSTAFEL" "ST JULIEN" "FREZENBERG WOOD" "POZIÉRES" "GUILLEMONT" "FLERS-COURCELETTE" "MORVAL" "THIEPVAL" "LE TRANSLOY" "ANCRE HEIGHTS" "ANCRE 1916 '18" "ARRAS 1917 '18" "SCARPE 1917" "BULLECOURT" "PILCKEM" "LANGEMARCK 1917" "MENIN ROAD" "POLYGON WOOD" "BROODSEINDE" "POELCAPPELLE" "PASSCHENDAELE" "ST QUENTIN" "BAILLEUL" "KEMMEL" "SOISSONAIS-OURCQ" "AMIENS" "HINDENBURG LINE" "EPÉHY" "CANAL DU NORD" "ST QUENTIN CANAL" "COURTRAI" "SAMBRE" "FRANCE AND FLANDERS" "PIAVE" "ITALY 1917-18" "STRUMA" "SUVLA" "LANDING AT SUVLA" "SCIMITAR HILL" "RUMANI" "EGYPT 1915-16" "VIMY 1917" "EL MUGHAR" "NEBI SAMWIL" "JERUSALEM" "JERICHO" "JORDAN" "TEL ASUR" "MEGIDDO" "SHARIN" "ADEN" "KHAN BAGHDADI" "MURMAN 1919". "DEFENCE OF ESCAUT" "MONT PICON" "LOWER MAAS" "ROER" "SYRIA 1941" "SIDI BARRANI" "TOBRUK SORTIE" "DEIR EL MUNASIB" "ADVANCE ON TRIPOLI" "TEBOURBA" "FORT MACGREGOR" "DJEBEL ANG" "DJEBEL DJAFFA PASS" "TUNIS" "MONTARNAUD" "ADRANO" "CENTURIPE" "MONTE STELLA" "SCAFATI BRIDGE" "GARIGLIANO CROSSING" "VOLTURNO CROSSING" "DAMIANO" "TRIGNO" "GOTHIC LINE" "CAPTURE OF FORLI" "SENIO POCKET" "SENIO FLOODBANK" "FILO" "CASA FABRI RIDGE" "MANATE" "ARGENTA GAP" "GREECE 1944-45" "KAMPAR" "YENANGYAUNG 1945" "MEDJEZ PLAIN" "SITTANG 1945" "CHINDITS 1944" "BURMA 1943-45". The Cypher consists of two "C"s interlaced within the Garter. On the Third Colour the Cypher is surmounted by a Crown. The Queen's was raised in 1661 for the specific purpose of garrisoning Tangier, which was part of the dowry brought by the Portuguese Princess, Catherine of Braganza, on her marriage to King Charles II. Thus from its inception the Regiment was associated with the Queen and was graciously permitted to bear her cypher upon its Colours. Queen Catherine died in 1705, and the Regiment, designated for the first time "The Queen's" in 1684, continued to enjoy the distinction of bearing upon its Colours the Cypher of the Queen, or the Queen Consort until 1910. 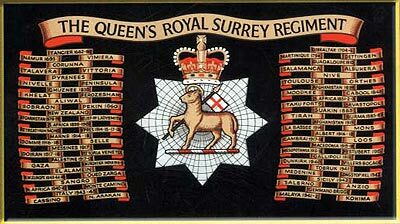 At this time new Colours were to be presented to the 4th Battalion The Queen's (Royal West Surrey Regiment) TF and a drawing prepared for these Colours bore the Cypher of the then sovereign, King Edward VII. The fact that the Colours of the Regiment had never borne the Cypher of a male sovereign was pointed out and His Majesty graciously approved of the permanent restitution of the Cypher of Queen Catherine, the Regiment's original Cypher, to the Colour. All Colours, which were then in service in the Regiment, were altered to conform and to this day bear the original Cypher. This distinction recalls the part played by The Queen's when acting as Marines during the Battle of The Glorious 1st of June 1794. The Regiment was embarked on board five ships of the Line - HMS Queen Charlotte (Admiral Lord Howe's flagship), HMS Russell, HMS Defence, HMS Royal George and HMS Majestic. The Naval Crown was granted in recognition of the Regiment's gallant conduct and contribution to this victory. It is borne on the Regimental Colour. The Glorious 1st of June continues to be a Regimental Day to the present and links have been maintained with the Royal Navy and Royal Marines. Until 1984 celebrations were maintained at HMS Excellent, the Naval Gunnery School at Whale Island, which inherited the traditions of the old "Queen Charlotte". For a period HMS Excellent was decommissioned and the celebrations were maintained by HMS Nelson. On HMS Excellent being recommissioned, the traditions are once again maintained by this shore establishment. 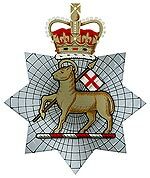 The Sphinx is borne on the Regimental Colour as a Battle Honour commemorating the part played by The Queen's in the Egyptian campaign of 1801, especially in the Battles of Aboukir and Alexandria, in which the Commander-in-Chief, Sir Ralph Abercrombie, was mortally wounded. "Pristinea Virtutis Memor", may be translated as "Mindful of the Gallant Actions of the Past", and "Vel Exuviae Triumphant" as "Even in defeat there can be triumph". The origins of both mottoes are obscure. It seems probable that "Pristinae Virtutis Memor" was awarded to the Regiment at some time in commemoration of its ancient services at Tangier. It was long a tradition that "Vel Exuviae Triumphant" commemorated the fighting at Tongres in 1703 when Lord Portmore's Regiment with a Dutch Regiment held up the advance of 40,000 French for 28 hours and enabled the Allied army to assemble. The 2nd Regiment of Foot The Queen's Royal (West Surrey) Regiment. "TANGIER 1662-80" "NAMUR 1695" "VIMIERA" "CORUNNA" "SALAMANCA" "VITTORIA" "PYRENEES" "NIVELLE" "TOULOUSE" "PENINSULA" "GHUZNEE 1839" "KHELAT" "AFFGHANISTAN 1839" "SOUTH AFRICA 1851-2-3" "TAKU FORTS" "PEKIN 1860" "BURMA 1885-87" "TIRAH" "RELIEF OF LADYSMITH" "SOUTH AFRICA 1899-1902"
THE GREAT WAR - 31 BATTALIONS - "MONS" "RETREAT FROM MONS" "MARNE 1914 '18" "AISNE 1914" "YPRES 1914 '17 '18" "LANGEMARCK 1914" "GHELUVELT" "AUBERS" "FESTUBERT 1915" "LOOS" "SOMME 1916 '18" "ALBERT 1916 '18" "BAZENTIN" "DELVILLE WOOD" "POZIÉRES" "GUILLEMONT" "FLERS-COURCELETTE" "MORVAL" "THIEPVAL" "LE TRANSLOY" "ANCRE HEIGHTS" "ANCRE 1916 '18" "ARRAS 1917 '18" "SCARPE 1917" "BULLECOURT" "MESSINES 1917" "PILCKEM" "MENIN ROAD" "POLYGON WOOD" "BROODSEINDE" "PASSCHENDAELE" "CAMBRAI 1917 '18" "ST QUENTIN" "BAPAUME 1918" "ROSIÉRES" "AVRE" "VILLERS BRETONNEUX" "LYS" "HAZEBROUCK" "BAILLEUL" "KEMMEL" "SOISSONNAIS-OURCQ, AND FLANDERS 1914-18" "PIAVE" "VITTORIA VENETO" "ITALY 1917-18" "DOIRAN 1917" "MACEDONIA 1916-17" "SUVLA" "LANDING AT SUVLA" "SCIMITAR HILL" "GALLIPOLI 1915" "RUMANI" "EGYPT 1915-16" "GAZA" "EL MUGHAR" "NEBI SAMWILL" "JERUSALEM" "JERICHO" "JORDAN" "TEL ASUR" "MEGIDDO" "SHARIN" "PALESTINE 1917-18" "KHAN BAGHDADI" "MESOPOTAMIA 1915-18" "N W FRONTIER INDIA 1916-17" "AFGHANISTAN 1919". THE SECOND WORLD WAR - "DEFENCE OF ESCAUT" "VILLERS BOCAGE" "MONT PINCON" "LOWERMAAS" "ROER" "NORTHWEST EUROPE 1940 '44-45" "SYRIA 1941" "SIDI BARRANI" "TOBRUK 1941" "TOBRUK SORTIE" "DEIR EL MUNASIB" "EL ALAMEIN" "ADVANCE ON TRIPOLI" "MEDENINE" "TUNIS" "NORTH AFRICA 1940-43" "SALERNO" "MONTE STELLA" "SCAFATI BRIDGE" "VOLTURNO CROSSING" "MONTE CAMINO" "GARIGLIANO CROSSING" "DAMIANO" "ANZIO" "GOTHIC LINE" "GEMMANO RIDGE" "SENIO POCKET" "SENIO FLOODBANK" "CASA FABBRI RIDGE" "MENATE" "FILO" "ARGENTA GAP" "ITALY 1943-45" "NORTH ARAKAN" "KOHIMA" "YENANGYAUNG 1945" "SITTANG 1945" "CHINDITS 1944" "BURMA 1943-45". "GIBRALTAR 1704-5" "DETTINGEN" "MARTINIQUE 1794" "TALAVERA" "GUADELOUPE 1810" "ALBUHERA" "VITTORIA" "PYRENEES" "NIVELLE" "NIVE" "ORTHES" "PENINSULA" "CABOOL 1842" "MOODKEE" "FEROZESHAH" "ALIWAL" "SOBRAON" "SEVASTOPOL" "TAKU FORTS" "NEW ZEALAND" "AFGHANISTAN 1878-79" "SUAKIN 1885" "RELIEF OF LADYSMITH" "SOUTH AFRICA 1899-1902". THE GREAT WAR - 18 BATTALIONS - "MONS" "LE CATEAU" "RETREAT FROM MONS" "MARNE 1914" "AISNE 1914" "LA BASSÉE 1914" "ARMENTIÉRES 1914" "HILL 60" "YPRES 1915 '17 '18" "GRAVENSTAFEL" "ST JULIEN" "FREZENBERG" "BELLEWASRDE" "LOOS" "SOMME 1916 '18" "ALBERT 1916 '18" "BAZENTIN" "DELVILLE WOOD" "POZIÉRES" "GUILLEMONT" "FLERS-COURCELETTE" "MORVAL" "THIEPVAL" "LE TRANSLOY" "ANCRE HEIGHTS" "ANCRE 1916" "ARRAS 1917 '18" "VIMY 1917" "SCARPE 1917" "MESSINES 1917" "PILCKEM" "LANGEMARCK 1917" "MENIN ROAD" "POLYGON WOOD" "BROODSEINDE" "POELCAPPELLE" "PASSCHENDAELE" "CAMBRAI 1917 '18" "ST QUENTIN" "BAPAUME 1918" "ROSIÉRES" "AVRE" "LYS" "ESTAIRES" "HAZEBROUCK" "AMIENS" "HINDENBURG LINE" "EPÉHY" "CANAL DU NORD" "ST QUENTIN CANAL" "COURTRAI" "SELLE" "SAMBRE" "FRANCE AND FLANDERS 1914-18" "ITALY 1917-18" "STRUMA" "DOIRAN 1918" "MACEDONIA 1915-18" "EGYPT 1915" "ADEN" "MESOPOTAMIA 1917-18" "MURMAN 1919". THE SECOND WORLD WAR - "DEFENCE OF ESCAUT" "DUNKIRK 1940" "NORTH WEST EUROPE 1940" "TEBOURBA" "FORT MCGREGOR" "OUED ZARGA" "DJEBEL ANG" "DJEBEL DJAFFA PASS" "MEDJEZ PLAIN" "LONGSTOP HILL 1943" "TUNIS" "MONTARNAUD" "NORTH AFRICA 1942-43" "ADRANO" "CENTURIPE" "SICILY 1943" "TRIGNO" "SANGRO" "CASSINO" "CAPTURE OF FORLI" "ARGENTA GAP" "ITALY 1943-45" "KAMPAR" "MALAYA 1941-42".